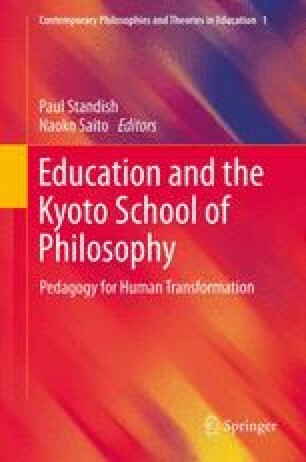 This essay uses the philosophy of education developed by Alfred North Whitehead as a framework by which to illuminate the idea of “pure experience” articulated by Nishida Kitarō (1870–1945), founder of the Kyoto school of modern Japanese philosophy. Whitehead’s idea of mental cultivation through a “rhythm of education” in three phases is applied to interpret Nishida’s concept of pure experience as a threefold developing system of consciousness. Whitehead agrees with Hegel that consciousness unfolds by the three dialectical stages of (i) thesis, (ii) antithesis, and (iii) synthesis. Or in Whitehead’s own vocabulary, mental growth develops by the three stages of (i) romanticism, (ii) precision, and (iii) generalization. Using the contemporary Japanese scholarship of Kosaka Kunitsugu, I then argue that for Nishida, pure experience is a self-developing system of consciousness that unfolds by a Hegelian dialectical process consisting of three moments. According to Kosaka, Nishida’s Zen-tinged concept of pure experience as a spontaneously developing system of consciousness unfolds in three dialectical stages: (i) the pre-rational stage of original pure experience as an implicit unity; (ii) the rational stage of pure experience that emerges by development of mental distinctions; and (iii) the trans-rational stage of pure experience as a unified enveloping whole underlying cognitive judgments grasped by a unifying act of intellectual intuition. Moreover, I have emphasized how for both Whitehead and Nishida, the development of consciousness in three moments itself culminates in practical wisdom as the use of knowledge in everyday life, thereby establishing a continuity of action and knowledge. Finally, it has been underscored how for both Whitehead and Nishida, mental cultivation is aimed toward practical wisdom as an awakening to the vivid qualitative flow of pure or immediate experience, itself functioning as the unifying source of all value-realization in ordinary experience of everyday life, including all cognitive as well as aesthetic, moral and religious values.